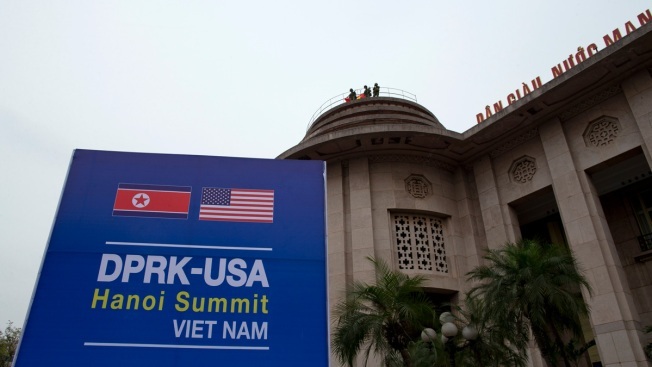 Vietnamese soldiers watch from a top of a building neighboring Government Guesthouse and the Metropole hotel next to a poster featuring upcoming summit between the U.S. and North Korea in Hanoi, Vietnam, Sunday, Feb. 24, 2019. The second summit between U.S President Donald Trump and North Korean leader Kim Jong Un will take place in Hanoi on Feb. 27 and 28. President Donald Trump is trying to manage expectations for his second summit with North Korean leader Kim Jong Un, predicting a "continuation of the progress" made last time. Trump tweeted Sunday that he was leaving early the next day for the meeting in Hanoi, Vietnam, adding a tantalizing nod to "Denuclearization?" He also said Kim knows that "without nuclear weapons, his country could fast become one of the great economic powers anywhere in the World." Their first meeting, in Singapore in June, produced a vaguely worded commitment from North Korea to dismantle its nuclear weapons program. Heading into this week's summit, Trump has said that North Korea has not tested any nuclear weapons in months and that as long as that testing has ceased, he's in no rush. Secretary of State Mike Pompeo said on "Fox News Sunday" that he was hoping for a "substantive step forward." But, he cautioned, "it may not happen, but I hope that it will." "President Trump has also said this is going to take time. There may have to be another summit. We may not get everything done this week," Pompeo said. Sen. Ed Markey, a Massachusetts Democrat who serves on the Senate foreign relations committee, expressed concerns about Trump's negotiating efforts Sunday on CBS, saying the president must be "careful" with what he offers. Said Markey: "Nothing is clear, and I think as a result we could run the risk that Kim is given concessions which are not accompanied by real concessions that the United States is receiving in return from Kim and his regime." Trump pushed back against his critics on Twitter Sunday, saying: "So funny to watch people who have failed for years, they got NOTHING, telling me how to negotiate with North Korea. But thanks anyway!" Pompeo said he hoped to put a "road map" in place, but would not discuss the possibility of declaring a formal end to the Korean War or pulling some American troops from South Korea, in keeping with his stand against publicly discussing issue that could arise during the negotiations. Pompeo said he believes North Korea remains a nuclear threat, though Trump tweeted after the Singapore summit that "there is no longer a Nuclear Threat from North Korea." Pompeo told CNN's "State of the Union" that the commitment Kim made "had substantially taken down the risk to the American people." Speaking on CNN, Pompeo also said "verifiable denuclearization" remained the administration's goal, and he insisted the administration has not changed the conditions for sanctions relief.